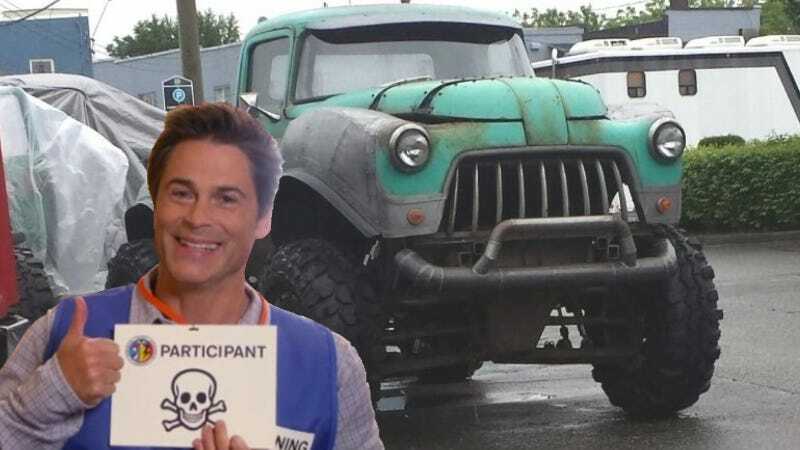 Everyone who seems to know agrees that Rob Lowe has joined Danny Glover, Lucas Till, and some other less-famous people to make a live-action/CGI hybrid action/comedy movie about monster trucks. I know, right? But that's about all anybody knows; every outlet confirming the movie's existence also says the plot is being "kept under wraps." First off, really? Secondly that gives you all a great opportunity to help me figure out what kind of awesome/asinine story Paramount Pictures and/or supposed partner Hasbro could possibly come up with surrounding these actors and monster trucks. Reader Spacedogg tells us these pictures are from the last day of shooting in Chilliwack, British Columbia... where some residents are furiously ranting about it on the IMDB forums. The rigs actually look pretty sweet— guess they say "Danger Radiation Hazard" on the side. Nuclear off-roading? Giddyup! Apparently Monster Trucks, or whatever it ends up being called, is slated to come be in theaters much exactly one year from now; May 29th 2015. Can't wait? Consider this the official thread for collecting intel on and speculating the plot/purpose of this movie. If you'd like to express your opinions on how Monster Trucks will turn out, please do so using Rob Lowe gifs.